As the years went by and modern baits became more lifelike I found that I used them more, today I use for all my fishing artificial bait. Goodbye dew worms, shrimp and other creepy crawlies. Goodbye catching live baitfish and hello life like artificial bait. I never have been very keen on the idea to bait fishing hooks with live bait. It had nothing to do with ethics or that I felt sorry for the bait critters. If the truth were known I dislike getting this slippery, wiggling things on the hook, it somehow revolted me. Life bait also never last long on the hook making re-baiting a frequent necessity. This in turn translates to carry a lot of live bait around and it’s expensive too. These days a dozen dew worms can cost anything from two to four dollars and a dozen worms are used up in no time whatsoever. So when Berkley started to produce life like plastic bait I was very pleased. At the beginning these new baits looked like the real thing but they didn’t smell, feel and behave like the real critter they simulated. However this has changed, with modern science and production artificial bait is infused with natural scent. Modern materials give the bait lifelike action in the water and made them resistant to wear and tear. Without a question in my mind Berkley produces some of the best artificial bait known to fishers. Here are some of the Berkley Gulp Alive artificial baits I use and that have produced consistently baits. 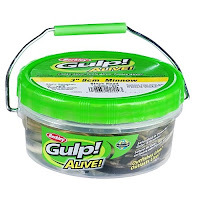 Gulp Alive Minnow come in sizes from 2 ½” to 3” and work well on trout, bass and salmon. I am sure they work just as well on other predatory fish too. Shrimp in the sizes from 2” to 4” work well to here on a variety of fish. The leech is another very realistic looking and smelling bait that fish find hard to resist. No more roe egg curing for me and putting up with the smell all over the house. Berkley has salmon roe eggs that not only look like the real stuff but makes salmon wanting to eat them too. Berkley offers under various names such as Gulp, Gulp Alive and Power Bait every lifelike bait critter imaginable, from the common earthworm to the more exotic catfish bait. Whatever it is the fish eat in your area and body of water Berkley has the bait in various colors and sizes to match the fish natural food source. With such an almost limitless assortment of bait and lures it is no wonder that Berkley for years is the number one choice of every tournament fisher. No more live bait for this fisherman and no more baiting hooks every few minutes. I spend more time fishing without mess and fuss and best of all I get more baits too. It seems fish can’t resist the new generation of Berkley baits either. For more information on products visit the Berkley website. Awww shucks - what ever happened to going out to the garden to dig up a bunch of worms? That was part of the excitement of the fishing trip when we were kids! :) Alas, as much as I enjoyed it as a kid, I've not enjoyed it so much as an adult, and I think Berkley makes a great product!